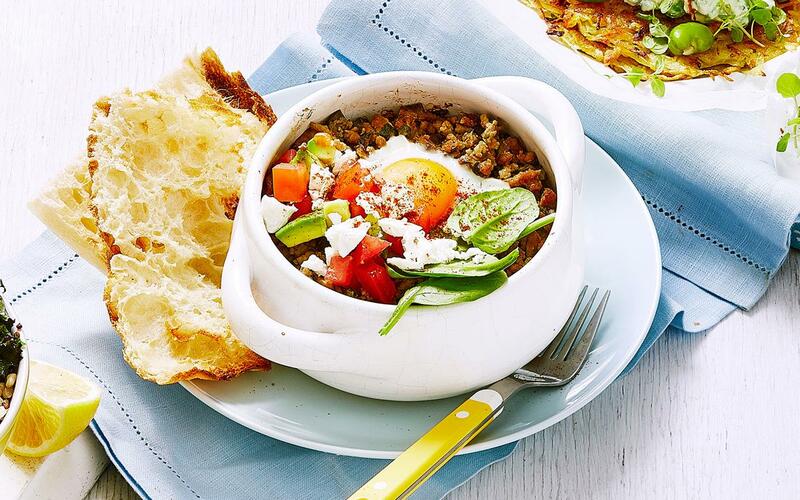 This delicious, cafe-style breakfast dish has all you could ask for - protein, healthy veggies, filling carbs and fragrant spices for days. There's really no better way to fuel your day. baby spinach, chopped tomato and avocado, crumbled feta, paprika and turkish bread to serve. 1. Preheat oven to 180°C. Arrange 4 ramekins or shallow pans on an oven tray. 2. In a large frying pan, heat oil on high. Saute eggplant and mushrooms for 2-3 minutes until tender and golden. Mix in green onions and cook, stirring, for 1 minute. 3. Add veal mince and brown, breaking up lumps, for 4-5 minutes. Stir in dried oregano, ground cumin, smoked paprika and dried chilli flakes and cook for 1 minute. Mix in water and lemon juice and cook for 30 seconds until evaporated. 4. Spoon mixture between pans. Make a recess in the centre. Break an egg into each recess. Cover loosely with foil. Bake for 10-15 minutes. 5. Serve pots scattered with baby spinach leaves, chopped tomato and avocado, crumbled feta and a sprinkle of paprika. Accompany with toasted turkish bread.